It's really simple. I love how every photo tells a story. Some short stories, some long tales. I want to know what is your favourite photo of yourself. Everyone has one. The photo they look at and smile. It reminds them of something, some time, some place. A moment in time. So share the photo, share the story and then tag three other people. 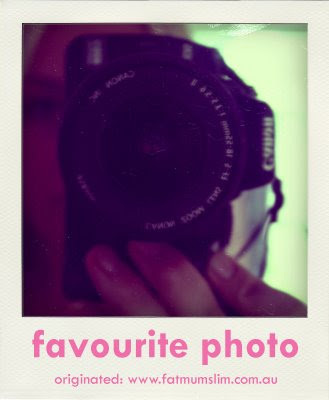 I want to see photos and stories all around the blogosphere. I was tagged by the lovely Danimezza to take part in this project which started over at fat.mum.slim. It is by no means the most attractive photo of me- not even close! I'm not wearing make-up, I have a totally dorky grin on my face - in fact I'm pretty sure I was wearing pajamas (underneath my huge winter coat, gloves and boot, and daggy tourist hat, hehe). But it's the memory that makes this photo so special. This photo was taken when Peter and I were on our honeymoon, in New Zealand. We had woken up that morning in Queenstown to snow falling outside our little cabin. It was sooo cold, and Peter was whinging that he didn't want to get out of bed. I stood up, and open the curtains and made the announcement: It's SNOWING!!!!! Well, I've never seen a person move so fast in my life. In one fluid motion he was out of bed, dressed, pulling on his coat and out the door! Us Queenslanders had barely ever been cold, let alone been in the snow, so it was major excitement all round. That day we had to travel to Te Anau, and it was snowing the whole drive. It had stopped by the time we got there, and most of it had melted, so we were a little bit dissapointed that hadn't got to have a really good play in it. This photo was taken that night. We had finished dinner, and were in our pajamas, about to watch a movie, when I happened to flick open the curtains and once again: IT's SNOWING!!!! On went the coats, hats, gloves and boots, and out we went. I'm sure the locals were looking at us rolling their eyes thinking, 'Crazy Australians!!!'. No one else was out there playing. We had a great time. It was much heavier than it had been that morning, and we got a lovely big layer all over our car. Pete decided to build a bit snowman and started to scrape it into big piles, but I had other ideas. I stole his snow-man body and used it as ammunition in a snow fight! We must have run around out there for about 2 hours in the freezing cold, making snow-angels, throwing snow-balls, dancing in the beautiful falling snow. It was pure bliss- I don't think we could have smiled any bigger if we'd tried! Such a wonderful moment, and it captures and epitomises one of the things I love most about our marriage. The fact that we are best mates, and can have so much fun together! We're not afraid to look silly, or be silly - as long as we're doing it together. Copy and paste the text in bold as well as the Favourite photo graphic to your post. Nothing like a bit of snow to make Australians go crazy! I's a nice pic and very good memory! That's a cute photo, you guys look so happy and and carefree there.